Q: My husband and I are considering major remodels of our kitchen and master bathroom, but we’re a little skittish about how much it will end up costing us. How much should we budget? A: When considering remodeling, most people’s first question is: what will it cost? National averages are not comparable to Seattle’s bustling housing market and contractors don’t post prices online. Due to a lack of accessible data, homeowners often experience sticker shock when they get their quote. To help you prepare, this brief introduction to pricing will help homeowners understand the two things that impact the cost most: the size of the company you hire and the finishes you choose. First, remodeling costs vary based on the contractor you choose. You’ll save the most money by doing the work yourself, but that can be risky. If you lack the skills or time to DIY, you have two options: hire a solo professional or contract with a full-scale remodeling company. A self-employed carpenter is a one-person show and can carry out most of the project solo. For a remodel with no structural changes, solo contractors may provide more flexible scheduling at a lower price, but you must often spend time sourcing materials yourself and the quality is not always guaranteed. Alternatively, a full-service contractor has a team of specialists from designers to supervisors. Hiring a team means higher prices to cover staff salaries, but more specialization and attention to detail. Some homeowners prefer this type of contractor because they can complete larger projects, provide comprehensive estimates and guarantee quality. Second, remodeling costs vary depending on the choices you make. Few homeowners nowadays opt for laminate countertops, wood cabinets and other economical choices. Since every item that goes into your remodel has a wide range of options, sticking to what’s in your price range is half the battle. It’s easy to choose more expensive materials and fixtures before you see the total project’s price soar. A good designer will save you money by only showing you the layout and materials within your budget. 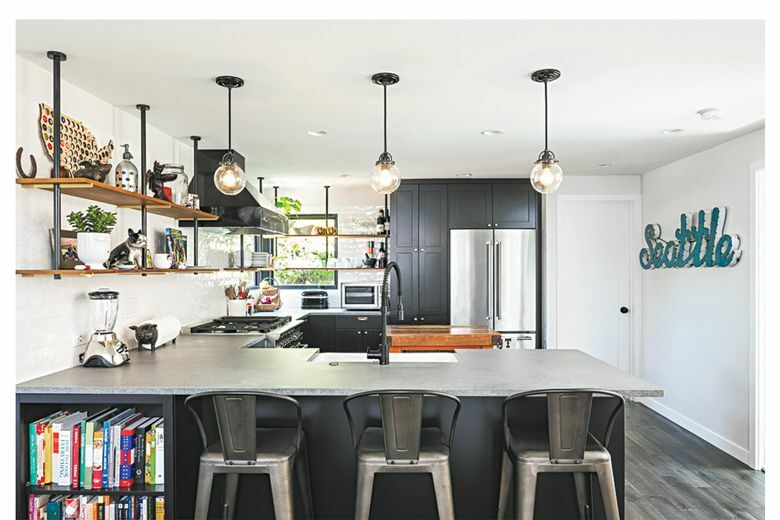 Below are some average costs found in Remodeling Magazine’s 2019 Cost vs. Value Report, an annual comparison of regional and national remodeling prices. (The complete report can be downloaded free at costvsvalue.com.) This report is thorough and a great starting point when considering a midsize design-build company. Remember, pricing is dependent on many interconnected factors — remodeling an older home, for example, almost always comes with challenges above and beyond the normal scope of a project. A contingency fund of 10 percent to cover these unanticipated costs is highly recommended. According to the Cost vs. Value Report, a kitchen remodel in Seattle averages $145,658. Compare that with the national average of $131,510 and you’ve already noticed the trend. Remodeling in Seattle costs more than in most U.S. cities. If white cabinets, quartz countertops and a ceramic-tile backsplash are what you’re looking for, your investment is going to be over $100,000. These materials fall under the “upscale” category in the report, but the reality is that these finishes have become standard. An upscale master-bathroom remodel in Seattle averages $74,198, according to the report. This includes a layout change — moving around plumbing and electrical — plus a tiled shower and a free-standing tub. The cost is significantly lower if you keep the existing layout, which most people do, and install a tub/shower combo. This will keep your bathroom remodel price tag closer to $50,000. According to the Cost vs. Value Report, an upscale master suite addition in Seattle averages $304,522 and a midrange one averages $150,345. While most additions fall somewhere in between, second-story additions almost always cost more than $300,000. Smaller additions such as dormers generally fall in the midrange category. Yes, it is costly to remodel in Seattle, but being upfront about costs helps homeowners make better decisions. Before you purchase a home to remodel or start planning an update to your current space, talk about the scope of your project with a reputable contractor to get the most accurate estimate. Every project is different, so you won’t know for sure until you ask. Jason Legat is founder and president of Model Remodel, a member of the Master Builders Association of King and Snohomish Counties (MBAKS). If you have a home improvement, remodeling or residential homebuilding question you’d like answered by one of the MBAKS’s nearly 2,900 members, write to homework@mbaks.com.